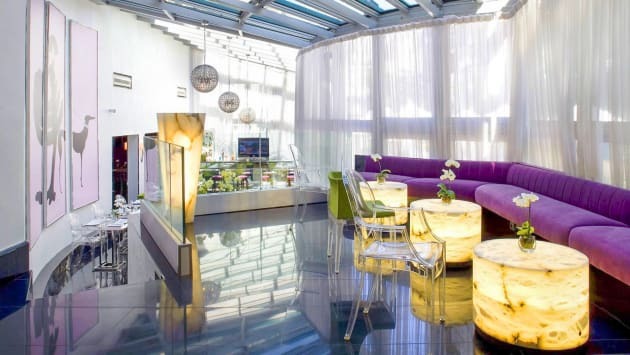 Enjoy modern French cuisine at the Atrium restaurant.The hotel also features a bar.Breakfast restaurant offering daily full American breakfast. 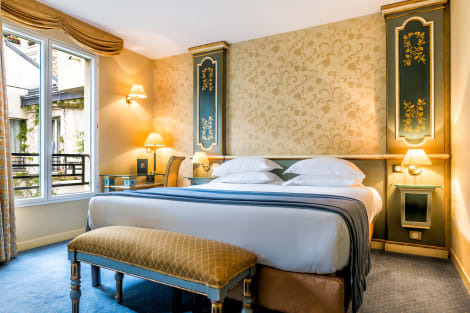 An elegant hotel in the Marais district of Paris, the 4-star Villa Beaumarchais is set close to Bastille square and a short walk from Chemin Vert Metro station with direct access to the Opéra Garnier. The spacious rooms are furnished with classic Parisian splendour and feature free wi-fi access, flatscreen TVs and en-suite bathrooms. Start the day with breakfast in the dining room, keep up your exercise routine at the fitness suite, and unwind with a drink in the lush indoor garden. Enjoy a smartphone in every room during your stay, with unlimited data, GPS, and local calls, unlimited calls to 37 countries in Continental Europe, UK, USA, Russia, China and Hong Kong. Useful tourist information, online ticketing service and many more. 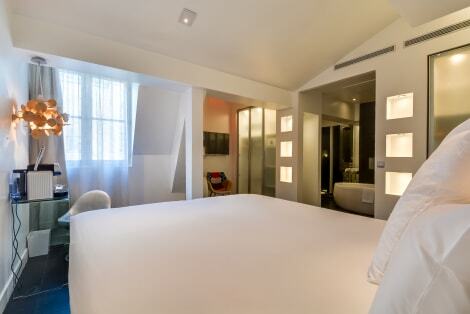 My Home In Paris is a contemporary 4-star hotel, found near Oberkampf in the up-and-coming 11th arrondissement of Paris. 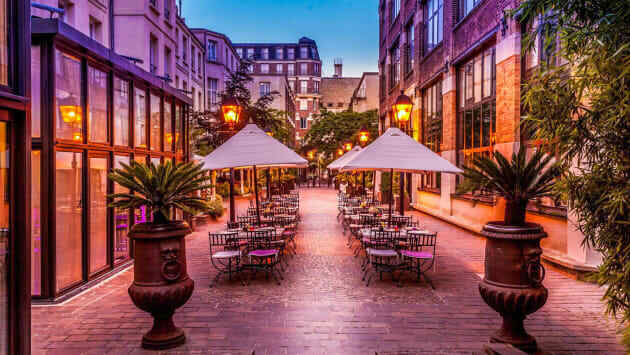 Having undergone a a complete renovation, the hotel now boasts elegant and comfortable guest rooms, a bar and a high level of personal service for a truly chic Parisian stay near Republique and the lively Marais District. Among the useful amenities on offer are free wi-fi, international TV channels in each room and a 24-hour reception service. Breakfast is at 17€ per person per day. 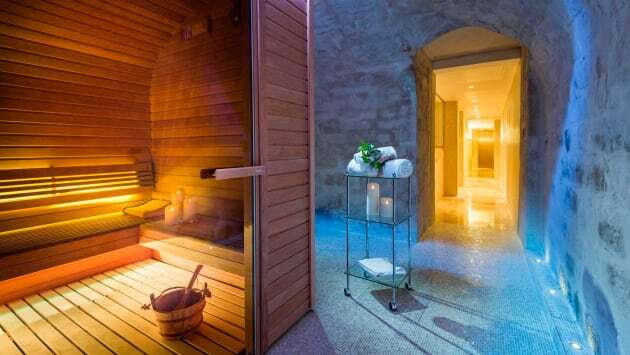 Offering 4-star service in the trendy Marais district of Paris, 1K Hotel is a boutique destination located close to Filles du Calvaire Metro station and a short walk to the Place des Vosges. 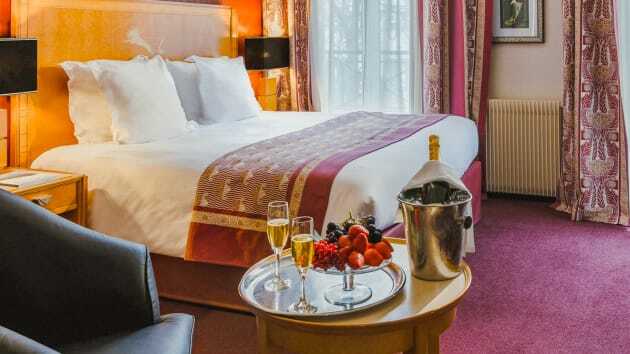 The rooms are brightly decorated and come equipped with a range of cutting-edge comforts including free wi-fi access and flatscreen TVs with full connectivity to Apple™ and Android™ phones. The South American-themed hotel bar, La Mezcaleria, serves high-quality mescal alongside cocktails and light meals. Enjoy complimentary VoD during your stay, as well as a smartphone in every room during your stay, with unlimited data, GPS, and local calls, unlimited calls to 37 countries in Continental Europe, UK, USA, Russia, China and Hong Kong. Useful tourist information, online ticketing service and many more. 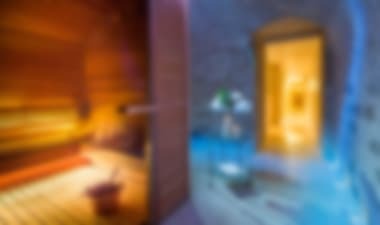 No need for a room key, enjoy a safe dematerialised access to your room thanks to the connected technology Sesame !